Home Fries Recipe - Crispy Breakfast Potatoes - VIDEO!!! This HOME FRIES RECIPE is the perfect side dish for any meal, whether it’s breakfast, lunch, or dinner. Crispy Breakfast Potatoes are a hearty way to start your day along with eggs and toast. And of course you can devour these savory Homes Fries for a little snack. 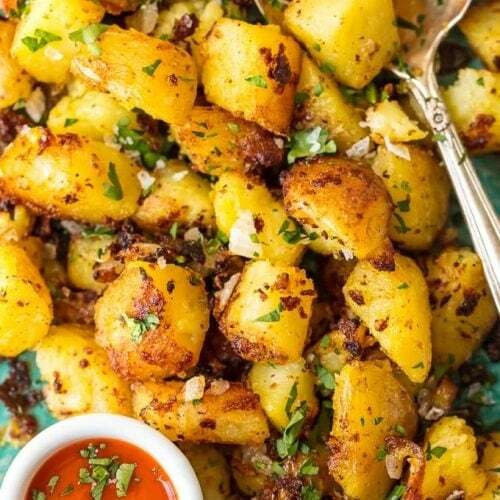 These tasty potatoes go with just about everything, and they’re oh so delicious! This home fries recipe goes with every meal, even breakfast. Start your morning with these crispy breakfast potatoes! This Home Fries Recipe is just too good. They’re crispy, savory, and full of flavor. And you can never go wrong with potatoes! I mean, who doesn’t like potatoes? They’re absolutely delicious, and they seem to go perfectly with every meal. Eat them with burgers, your favorite chicken recipe, or even eat them first thing in the morning. These Crispy Breakfast Potatoes will be the best addition to the breakfast table! 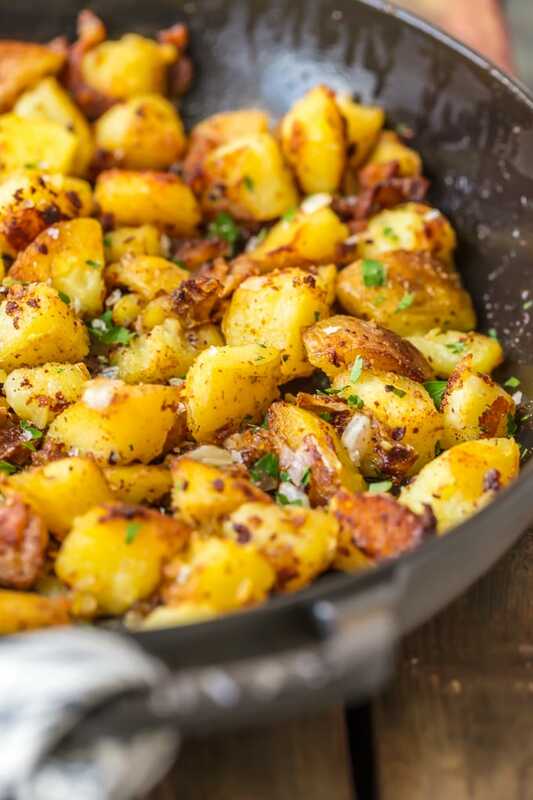 You’re gonna love this crispy home fries recipe, I guarantee it! 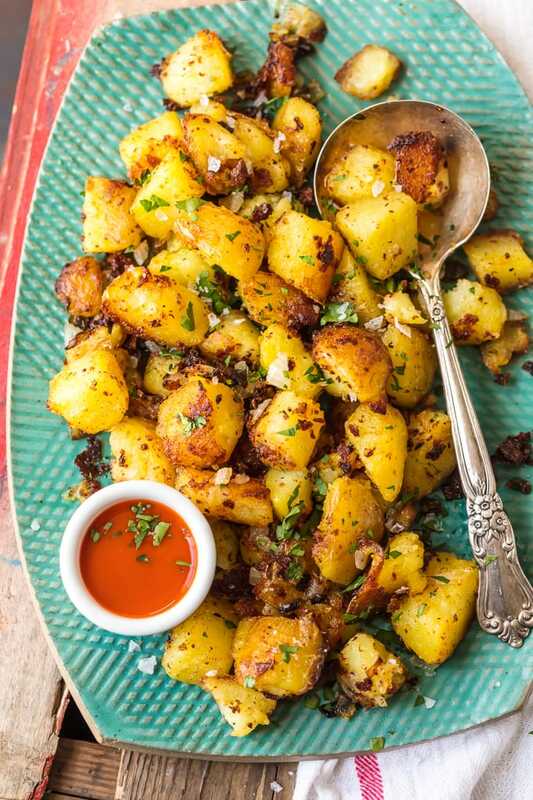 This Home Fries Recipe is savory & delicious! They’re the perfect side dish for any meal AND they are the best Crispy Breakfast Potatoes. Having something light and sweet for breakfast is nice some mornings, but I really love having a good, hot, savory breakfast. These Crispy Breakfast Potatoes are my ideal way to wake up. 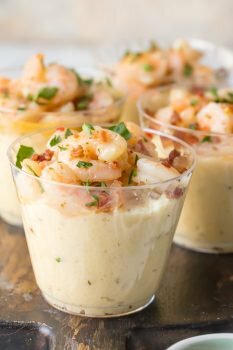 They’re super flavorful and very filling. They go well with eggs, toast, bacon, even pancakes or french toast. They always say that breakfast is the most important meal of the day, so add these crispy breakfast potatoes to the menu and start your day off on the right foot. Want to know how to make home fries? Don’t worry, it’s easy! Homes fries are such a simple dish and they taste good with absolutely everything. It’s such a great recipe to have at hand whenever you need to whip up a quick side dish. 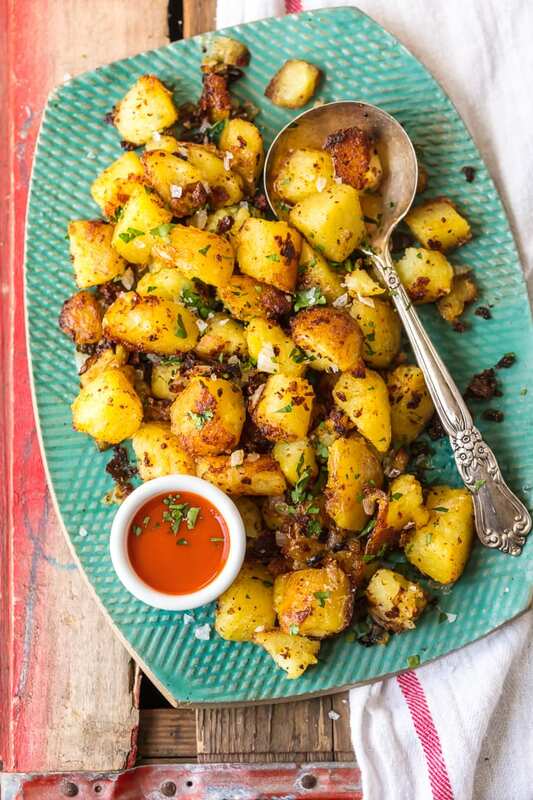 This home fries recipe is full of seasonings (so it’s extra tasty), and it’s easy to prepare. You don’t even need an oven! 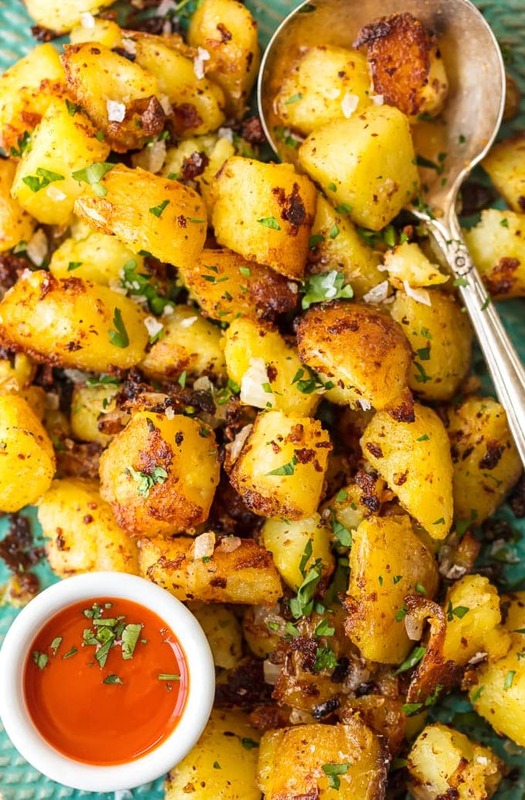 This easy home fries recipe is SO GOOD and it can be used for crispy breakfast potatoes too! See the recipe card at the bottom of this post for full instructions. 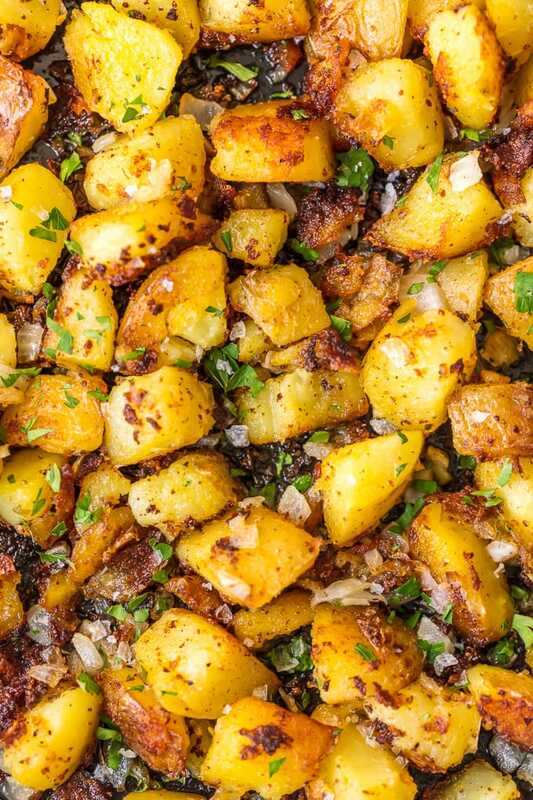 What kind of spices do you use to make home fries? You can use any type of herb or spices you like when making home fries. Salt & pepper are the most basic seasonings to add, but sometimes simplicity is best. For this homes fries recipe, we added sweet onion and thyme into the mix, plus we cooked the potatoes in butter & oil for an extra crispy, full flavor. You can also add in parsley, chives, or cilantro. You could even try adding in some bacon bits if you really like it savory. And if you’re looking for something to dip these home fries in, you can never go wrong with ketchup, sour cream, or hot sauce. If you want the perfect potatoes, then yes, you need to boil potatoes before frying them in a pan or skillet. The main reason for doing this is to remove the starch. If you put raw potatoes directly in a skillet, it will be very tough to cook them evenly. Because of the starch, the outside will likely burn before or become brown before the inside gets cooked. So you want to make sure you soak or boil them first. Boiling them will also help to soften the potatoes so they can fry up nicely in the skillet. 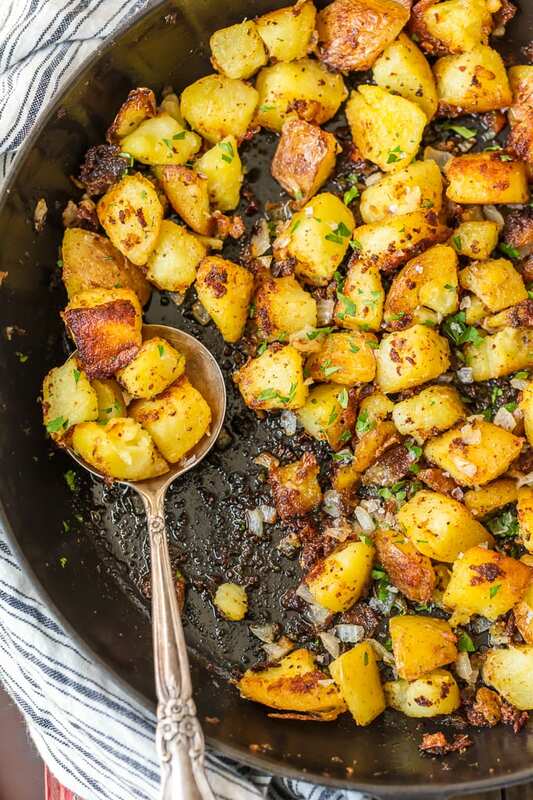 This Home Fries Recipe is one of my favorite potatoes dishes now. Cook them up with burgers, as a side dish, or make Crispy Breakfast Potatoes. No matter how or when you eat them, you’re going to love them! See the recipe card below for details on how to make Home Fries. Enjoy! Need even more breakfast recipes? We’ve got you covered! This HOME FRIES RECIPE is the perfect side dish for any meal, whether it's breakfast, lunch, or dinner. Crispy Breakfast Potatoes are a hearty way to start your day along with eggs and toast. And of course you can devour these savory Homes Fries for a little snack. 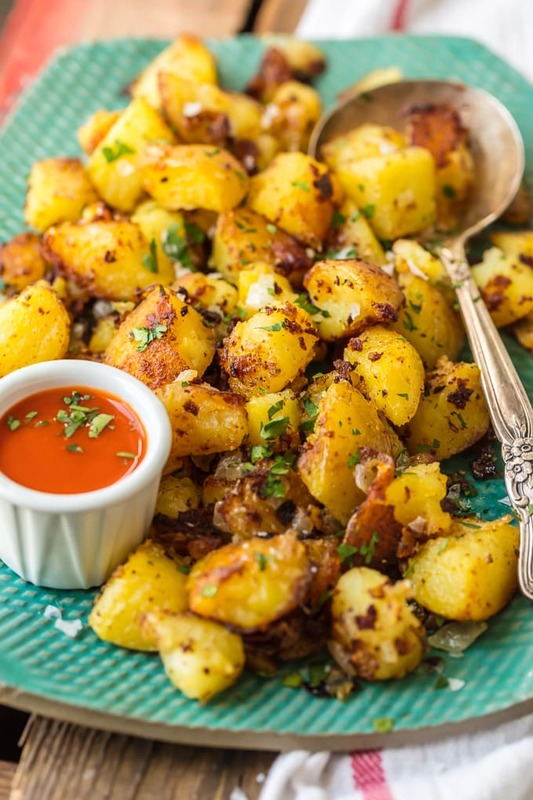 These tasty potatoes go with just about everything, and they're oh so delicious! Place the potatoes in a medium pot and cover with cold water. Add 1 tablespoon kosher salt and 1 tablespoon vinegar. Stir well. Set the heat to high and boil the potatoes until just tender (approximately 5 minutes after water has reached a boil). Drain. Cool, to touch, and cut potatoes into fourths. Place the potatoes in a bowl and toss with 1 tablespoon oil. While potatoes boil, heat 1 tablespoon oil and 1 tablespoon butter in a large skillet set over medium heat just until the oil shimmers. Add the onion, sprinkle with salt & pepper and cook until onion is translucent and tender, 3-4 minutes. Transfer onion to a paper-towel lined plate and remove skillet from heat. When potatoes are ready, set the skillet over medium heat and add 1 tablespoon oil and 1 tablespoon butter. Heat the oil & butter until the oil shimmers, and add the quartered potatoes. Season the potatoes with salt and pepper, and cook in a single layer until potatoes are crispy and lightly browned on the bottom (about 6 minutes). Add the cooked onions and thyme to the potatoes; toss and season to taste. If desired, add cilantro, parsley or chives. Serve immediately. Caprese Salad Recipe (Chopped Caprese Salad) VIDEO! I love potato dishes like these. It sounds like the perfect side dish to about any meal. I can’t wait to try them! I love a good homefries recipe. 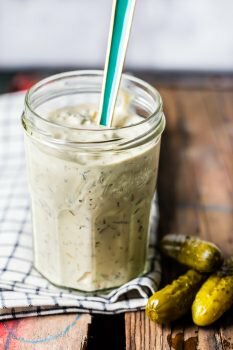 They are perfect for a side at so many meals! You can also microwave the potato and it turns out great. Just don’t microwave until they are mushy.